The moon has long been a favorite subject of photographers. This article will explain how to raise the bar for your moon photography by using a free and simple tool: the Photographer’s Ephemeris. The Photographer’s Ephemeris is a program that provides you with the timing and relative locations for sunrise, sunset, moon rise, and moon set. 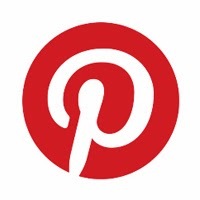 What makes it an invaluable resource, however, is its mapping function. You input a location, and the map overlays the direction of each event (sunrise, sunset, moon rise, and moon set). You can then move around your reference point to determine the best location to achieve a certain photograph. Let me explain with an example. I live in Madison, Wisconsin, and one of my bucket list shots has been to photograph the full moon rising above the city skyline, featuring the glowing dome of our state capitol building. There are several parks and public areas around the lake near the Capitol, from which I could shoot the skyline. Using the Photographer’s Ephemeris (Windows version), I was able to move the reference point around until the angle of the moon rise aligned directly with the Capitol. The narrow peninsula pictured in the map is a local park that offers several different unobstructed locations for viewing the skyline across the lake. Using the information from the Photographer’s Ephemeris, I was able to be set-up, on location and ready to go, knowing exactly when and where the moon would rise. 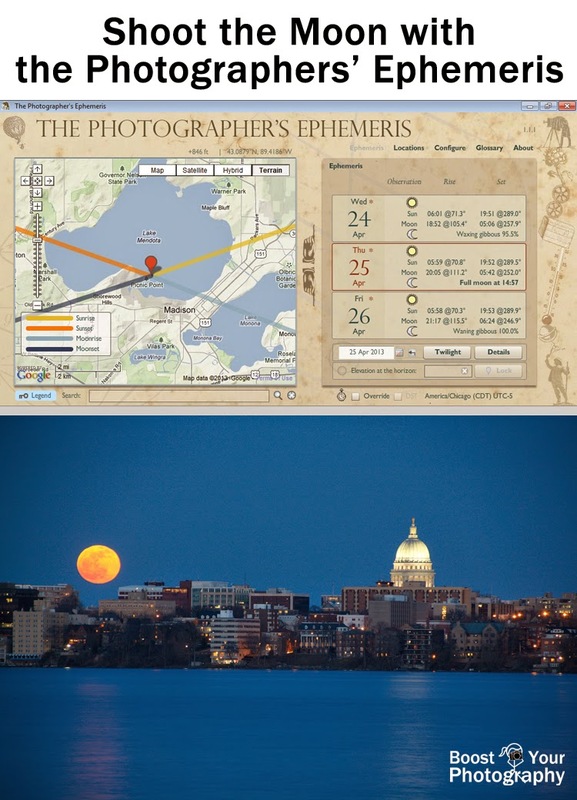 Above: screen shot of the PC version of the Photographer's Ephemeris showing Madison, Wisconsin. Below: Full moon rise against the Madison skyline and Capitol by Archaeofrog. Available for purchase. Once the moon started to come up, I realized that I would need to move a little bit further west back down the peninsula to get the moon even closer to the Capitol dome. However, I was stymied by the trees along the way, as there was no unobstructed location to get the alignment exactly as I wanted. I was very happy with the near-Capitol results that I obtained, but I will definitely continue to try again around each full moon. The relative angle of the moon rise shifts dramatically through the course of the year, so an alignment that worked one month may not for another. That is what makes the Photographer’s Ephemeris such a useful and convenient tool. The Photographer’s Ephemeris is also extremely handy when traveling, allowing you to precisely pinpoint locations to get dramatic sunrises, sunsets, moon rises, or moon sets against an incredible backdrop, architecture, or scenery. The Photographer’s Ephemeris is available for a wide variety of platforms. The home computer (Windows and Mac) versions are a free download, and mobile versions are available on iTunes ($8.99) and Android ($4.99). I highly recommend downloading and trying the program on your computer first, and then buying the app for your Smartphone or tablet if you find it useful.